Smart Economy: Al Gore: Planetary Triage? or Essenhigh: False Alarm? Al Gore: Planetary Triage? or Essenhigh: False Alarm? The film does a credible job in capturing Al Gore's multi-year and multi-continent lecture tour where he has presented over 1000 times to eager audiences, but is disappointing about offering any type of long ranging solutions. I was specificaly interested in not just the content, which of course is important, but in the method /style used by Gore to explain a fairly complex scientific topic to a lay audience. Combining powerful music scores, images, picture and graphs, Gore does a forceful job in getting his message across. I did however immediately question one study that Gore cited in the movie and his book, which raised some doubts in my mind . He refers to the study by Dr Naomi Oreskes, UCSD that was published in Science that concluded that out of 928 randomly selected peer-reviewed articles dealing with climate change published in scientific journal over a 10 year period, not one single article or 0% of the articles were in doubt as to the cause of global warming ie. that the prevailing academic consensus is that the current episode of global warming is all man -made. On page 262 of his book he contrasts that to another study that looked at 636 articles in the popular press ( NY Times, Washington Post etc) over 14 years ( why not take an equivalent time period ?). 53% of the articles were in doubt as to the cause of global warming. I found the movie's initial claim about the unanimity of the scientific community immediately suspicious and questionable because there is always some doubt in the academic community-- that's part of the scientific methodology. Checking the academic literature and the internet, I found other academics such as Benny Peiser, from Liverpool John Moores University that questioned Oreskes methodology and who independently repeated the survey and analysis and got rather different results. Science magazine however, then refused to publish Peiser's paper with the contradictory findings.
" only 13 (or 0.1%) explicitly endorse the 'consensus view'. " " 322 abstracts (or 29%) implicitly accept the 'consensus view' but mainly focus on impact assessments of envisaged global climate change. " " Less than 10% of the abstracts (89) focus on "mitigation". " " 67 abstracts mainly focus on methodological questions. " " 87 abstracts deal exclusively with paleo-climatological research unrelated to recent climate change. " " 34 abstracts reject or doubt the view that human activities are the main drivers of the "the observed warming over the last 50 years". " 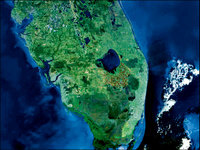 " 44 abstracts focus on natural factors of global climate change. " Despite that one controversial study, I found the Gore film persuasive and a good piece of PR to stir people, communities and hopefully politicians into action and discussing mitigation strategies. I didn't like his Bush-bashing, although I fully expected it. The Bush administration, which has rejected the Kyoto Protocol on control of greenhouse gas emissions, prefers letting industry take voluntary steps. 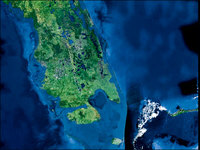 The United States BTW accounts for a quarter of the world's greenhouse gases. "Underlying it all is a mission to move the United States and the world past a tipping point, and to change the minds of enough people so that they demand that politicians in all political parties take action to stop this crisis,'' said Gore in a recent interview. 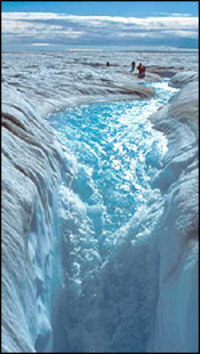 Other strong images in the film were the prior and recent pictures of disappearing snows and glaciers of Mount Kilimanjaro, the increase in extreme weather conditions as seen in simultaneous droughts and floods in China and other parts of the world and moulins forming in Greenland's glaciers that could send them sliding on mass into the ocean, like we saw on the Larsen-B ice shelf in the Antarctic several years ago. 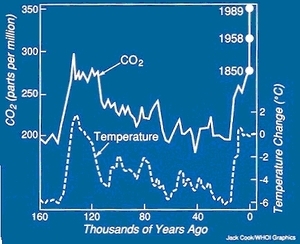 Gore makes use of the famous Vostok ice core sample graph (above) that compares CO2 variability and temperature variability over the 1000's of years on earth. Everyone seems to be making the assumption that it is CO2 or other greenhouse gases that is causing temperature spikes. I'm not entirely convinced. Other scientists question this too and offer other explanations. There are detractors who present a strong scientific case such as Robert H. Essenhigh of Ohio state who supports this different view. 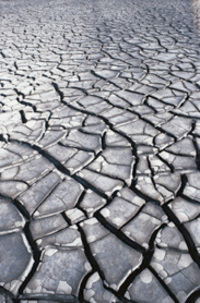 In a Ohio State Press Release called Global Warming is Natural and that it may end within 20 Years he cites a 1995 report from the Intergovernmental Panel on Climate Change (IPCC), a panel formed by the World Meteorological Organization and the United Nations Environment Programme in 1988 to assess the risk of human-induced climate change. In the report, the IPCC wrote that some 90 billion tons of carbon as carbon dioxide annually circulate between the earth's ocean and the atmosphere, and another 60 billion tons exchange between the vegetation and the atmosphere. Compared to man-made sources' emission of about 5 to 6 billion tons per year, the natural sources would then account for more than 95 percent of all atmospheric carbon dioxide, Essenhigh said. Some scientists believe that the human contribution to carbon dioxide in the atmosphere, however small, is of a critical amount that could nonetheless upset Earth's environmental balance (the tipping point) . But Essenhigh feels that, mathematically, that hypothesis hasn't been adequately substantiated. As temperatures rise, the carbon dioxide equilibrium in the water changes, and this releases more carbon dioxide into the atmosphere. According to this scenario, atmospheric carbon dioxide is then an indicator of rising temperatures -- not the driving force behind it. Essenhigh attributes the current reported rise in global temperatures to a natural cycle of warming and cooling. "At 6 billion tons, humans are then responsible for a comparatively small amount - less than 5 percent - of atmospheric carbon dioxide," he said. "And if nature is the source of the rest of the carbon dioxide, then it is difficult to see that man-made carbon dioxide can be driving the rising temperatures. In fact, I don't believe it does." According to Essenhigh's estimations, Earth may reach a peak in the current temperature profile within the next 10 to 20 years, and then it could begin to cool into a new ice age. Essenhigh knows that his scientific opinion is a minority one. As far as he knows, he's the only person who's linked global warming and carbon dioxide in this particular way. But he maintains his evaluations represent an improvement on those of the majority opinion, because they are logically rigorous and includes water vapor as a far more significant factor than in other studies. We obviously have more then two solitutes here, as CP Snow put it. The Bush Camp teamed up with industry against the environmentalists or extremeists, as they see them. Then there is the pro and anti academic camps too. Instead of giving an objective account of both sides of the arguement, each sides filters data to support their end of the arguement. US leaders are being accused of editing scientific reports on global warming. The reports would be altered to play down the problem of climatic change. Last week BBC aired a program about a US government whistleblower and many other scientists who told how scientific reports about global warming have been systematically changed and suppressed by the Bush administration. When Bush came to power in 2000 his administration selected advice which argued that global warming was not a result of human activities and that the phenomenon could be natural. It almost reminds me of the old Soviet Union --- the public is given the information the government wants them to hear rather than an honest description of the situation". Here is the link to the web site and the TV program...to the tune of: The Good, The Bad and the Ugly !! ..more scientific censorship accusations ...See "NOAA hiding truth about hurricanes, scientists say"
Personally I find the ongoing debate about global warming -is it man-made or natural a non-issue beyond the scientific community, since it only leads to uncertainty in the minds of politicians and therefore procrastination and in-action. Regardless of whose fault it is, we are still in dire trouble if this global warming hypothesis turns out to be true. Better safe then sorry. My recommendation: A must-see movie (& buy the book too). I found it to be educational, entertaining, funny and frightening all at the same time. 2. Dr Peiser compounded the previous error by assuming that Dr Oreskes got her figures wrong - rather than contacting Dr Oreskes to obtain her search criteria. 3. Of the 34 abstracts identified by Dr Peiser that reject or question the view that human activities are the main driving force of the observed warming over the last 50 years”, 12 are not in Dr Oreskes sample. Of the remain 22 articles, 21 do not fit that description (one argues that natural factors have been underestimated still does not reject or doubt that human activities are the main factor). In other words Dr Peiser has misinterpreted the abstracts of 21 articles. 4. Only one fits Dr Peiser's category, but it does not fit Oreskes' criteria of being a piece of published peer-reviewed research, but is instead a statement by the American Association of Petroleum Geologists. Dr Oreskes removed this from her sample partly because the statements by the AMS, AOG, & AAAS are not in her sample either. I accept that it was a mistake to include the abstract you mentioned (and some other rather ambiguous ones) in my critique of the Oreskes essay. In short: no, Peiser did not refute Oreskes. He tried but he failed. views that mandatory CO2 reduction would lead to all kind of bad economic news. Talk about paranoia. He saw Oreskes' study as a threat to the widespread acceptance of his views. Therefore he wanted to discredit it. As usually it happens when someone already has an agenda and tries to create "evidence" to back it up, Peiser simply made things up. Science had a good reason not to publish his fantasies. It's after all a serious paper.